Porphyrins are a group of heterocyclic macrocycle organic compounds, composed of four modified pyrrole subunits interconnected at their α carbon atoms via methine bridges (=CH−). The parent porphyrin is porphin, and substituted porphines are called porphyrins. 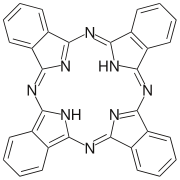 The porphyrin ring structure is aromatic, with a total of 26 electrons in the conjugated system. Various analyses indicate that not all atoms of the ring are involved equally in the conjugation or that the molecule’s overall nature is substantially based on several smaller conjugated systems. One result of the large conjugated system is that porphyrin molecules typically have very intense absorption bands in the visible region and may be deeply colored; the name “porphyrin” comes from the Greek word πορφύρα (porphyra), meaning purple. Many porphyrins are naturally occurring; one of the best-known porphyrins is heme, the pigment in red blood cells, a cofactor of the protein hemoglobin. In the side picture it is presented the structure of porphin, the simplest porphyrin. Many porphyrins are naturally occurring; one of the best-known porphyrins is heme, the pigment in red blood cells, a cofactor of the protein hemoglobin. Natural porphyrins, such as chlorophyll and heme, are fundamental for the development of vital functions of organisms. In particular the chlorophyll allows the photosynthesis in plants, following the absorption of light which is then transformed into chemical energy necessary to the plant. 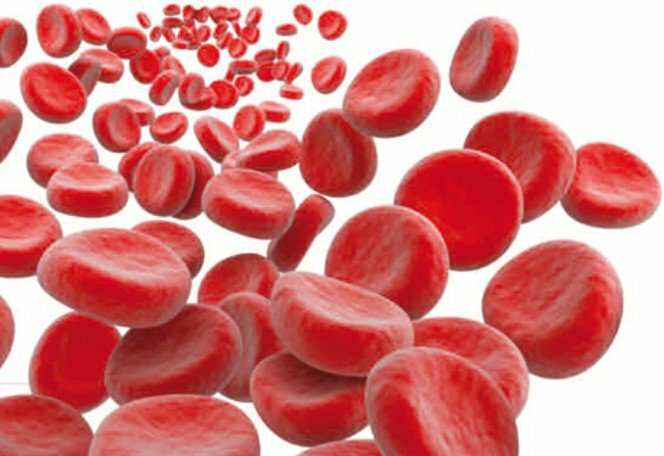 The heme group present in hemoglobin, instead allows the proper oxygenation of the various tissues in animals by acting as oxygen carrier. The animated gif to the right shows the porphyrin ring structure. The high conjugation present in these molecules is one of the main features that allow its application and use for different purposes, which has also led to the preparation of synthetic porphyrins. There are examples used as colorants in the field of paints, plastics and chemical fiber materials. 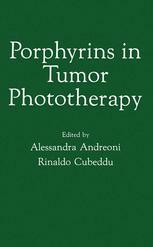 Some types of synthetic porphyrins can also be used as photosensitizers in photodynamic therapy (PDT). A common feature of this class of molecules is the interaction with electromagnetic radiation which gives rise to interesting phenomena of absorption and fluorescence in the visible region. With the DIY Spectrometer, already described in the post “Webcam Diffracton Spectrometer“, we performed a series of measurements, of absorption and fluorescence, on some of the most interesting porphyrins. 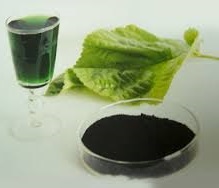 Chlorophyll is a green pigment found in chloroplasts of algae and plants. Chlorophyll is an extremely important biomolecule, critical in photosynthesis, which allows plants to absorb energy from light. Chlorophyll absorbs light most strongly in the blue portion of the electromagnetic spectrum, followed by the red portion. Conversely, it is a poor absorber of green and near-green portions of the spectrum, hence the green color of chlorophyll-containing tissues. Measurement of the absorption of light is complicated by the solvent used to extract it from plant material, which affects the values obtained. In diethyl ether, chlorophyll A has approximate absorbance maximum of 430 nm and 662 nm, while chlorophyll B has approximate maximum of 453 nm and 642 nm. Chlorophyll A fluoresces at 673 nm (maximum) and 726 nm. 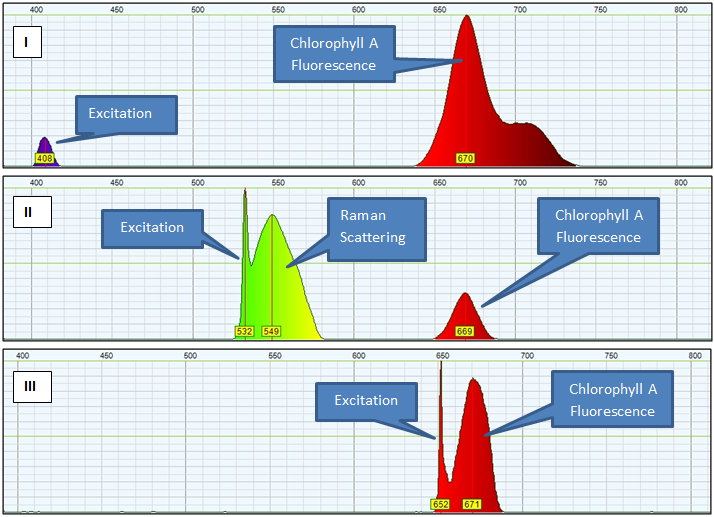 The different absorption spectra of Chlorophyll A and B achieve a better absorption of the sun radiation in order to enhance the efficiency of the photosynthesis. The green band from 500nm till to 600nm passes without absorption. There are two main absorption bands, the first one on the red the second one on the blue. 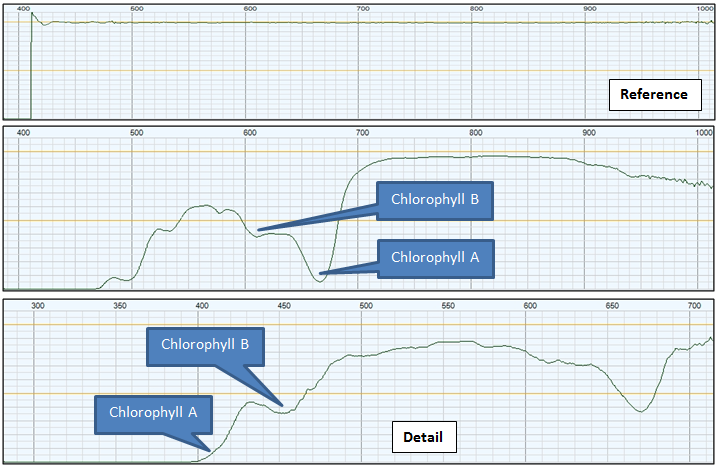 Two maxima between 600nm and 700nm correspond to absorption peaks of chlorophyll A and chlorophyll B. The absorption on the blue band can be explained with the sum of the absorptions of the two chlorophyll types. Hemoglobin is a globular protein whose quaternary structure consists of four sub-units. It is soluble, red (is a chromoprotein), and is present in the red blood cells of vertebrates, excluding some Antarctic fish. It is responsible for the transport of molecular oxygen from one compartment with high concentration of O2 to the tissues that need it. Each of its four protein cells, called globin, contains inside a molecule of protoporphyrin coordinating an iron ion Fe(II), located slightly outside the plane of the molecule, collectively called Eme Group. When it binds to oxygen hemoglobin is called oxyhemoglobin, and it is called deoxyhemoglobin in the unbound form. Phthalocyanine is an intensely blue-green-coloured aromatic macrocyclic compound that is widely used in dyeing. Phthalocyanines form coordination complexes with most elements of the periodic table. 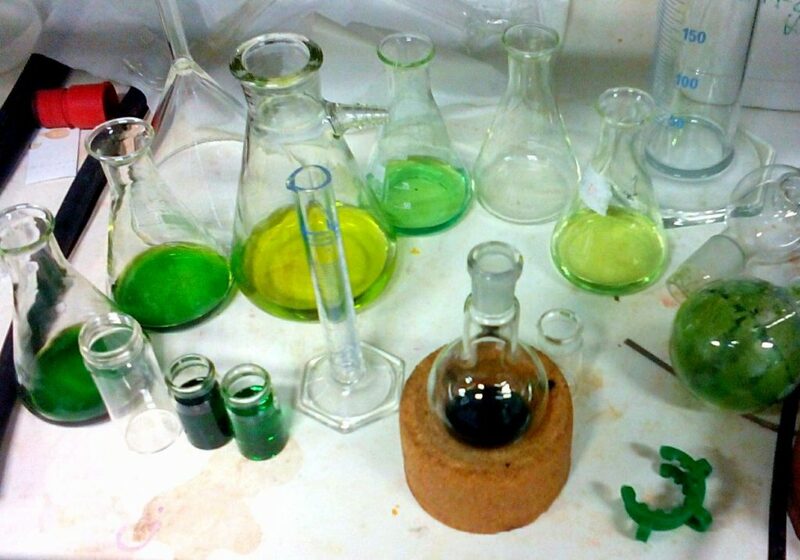 These complexes are also intensely colored and also are used as dyes or pigments. Phthalocyanines are organic compounds closely related to other tetrapyrrole macrocyles including porphyrins and porphyrazines. Phthalocyanines strongly absorb light between 600 and 700 nm, thus these materials are blue or green. 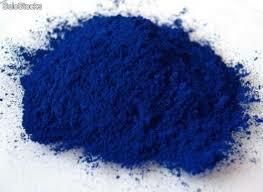 Approximately 25% of all artificial organic pigments are phthalocyanine derivatives. Vitamin B12, also called cobalamin, is a red-colored water-soluble vitamin with a key role in the normal functioning of the brain and nervous system, and for the formation of blood. It is one of the eight B vitamins. It is normally involved in the metabolism of every cell of the human body, especially affecting DNA synthesis and regulation, but also fatty acid metabolism and amino acid metabolism. 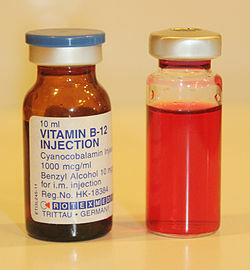 Neither fungi, plants, nor animals are capable of producing vitamin B12. Only bacteria and archaea have the enzymes required for its synthesis, although many foods are a natural source of B12 because of bacterial symbiosis. The vitamin is the largest and most structurally complicated vitamin and can be produced industrially only through bacterial fermentation-synthesis. Cobalamin is the most widely manufactured vitamin in the vitamin B12 family (the family of chemicals that function as B12 when put into the body), because cyanocobalamin is the most air-stable of the B12 forms. It is the easiest to crystallize and, therefore, easiest to purify after it is produced by bacterial fermentation, or synthesized in vitro. It can be obtained as dark red crystals or as an amorphous red powder. Its structure resembles the structure of porphyrins. Protoporphyrin IX is a biochemically widely used carrier molecule for divalent cations. 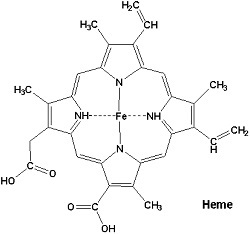 Together with iron (Fe 2+) the body of the heme- group of hemoglobin, myoglobin and many other heme-containing enzymes like cytochrome c and catalase are formed. 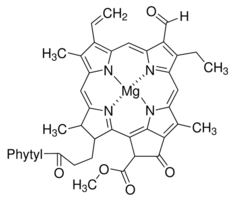 Complexed with magnesium-ions (Mg 2+) the main part of the Chlorophylls are formed. Complexed with zinc-ions (Zn 2+) it forms Zinc protoporphyrin. Protoporphyrin IX as a direct precursor of heme is accumulated by patients of erythropoietic protoporphyria, which is one of the genetic disorders of the biosynthesis of the heme -pathway. It causes a severe photosensivity against visible light. 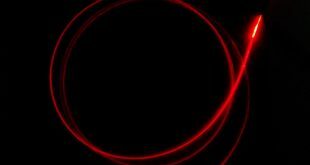 The sensitivity of protoporphyrin IX against light is also used as a therapy against different forms of cancer (photodynamic therapy, PDT). Protoporphyrins are deposited in the shells of the eggs of some birds as a brown or red pigment, either as a ground colour or as spotting. Protoporphyrins strengthen the egg shell, and are deposited where the shell is too thin as a result of calcium shortage. Spotting therefore tend to be heavier where the local soil is calcium-deficient, and in the eggs laid last in a clutch. 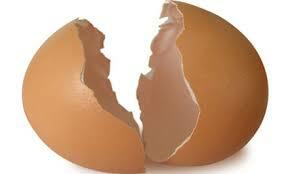 The solution of protoporphyrin analyzed was derived from the dissolution of egg shell fragments in hydrochloric acid. Hematoporphyrin is a porphyrin compound. Differs from protoporphyrin hemoglobin for the presence of two hydroxyethyl groups instead of two vinyl groups . Its importance is especially historic because it was the first prepared for porphyrin synthesis (starting at emine). Its biological role seems minor and his presence in the wild is not currently certain. 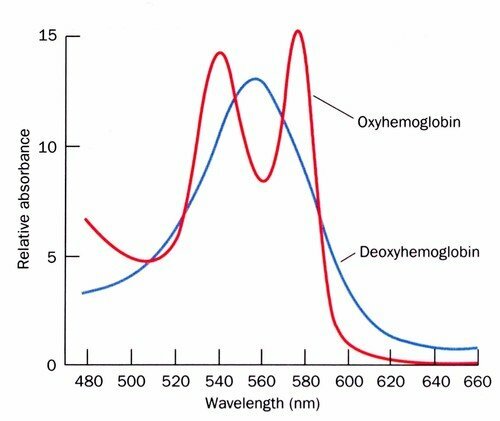 The hematoporphyrin is used as photosensitizer in photodynamic therapy (PDT).